An extensive collection of Venn diagram worksheets provided here will help students to use their analytical skills and study all possible logical relations between a finite collection of sets. A plethora of exercises that include finding, shading, and naming unions, intersections, differences, and complements are provided here. Some exercises will require students to represent the Boolean operation between the given sets. 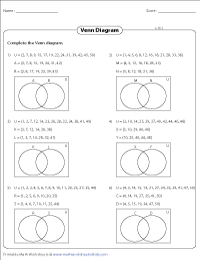 Worksheets on completing Venn diagrams based on a given set of data are also available for practice. 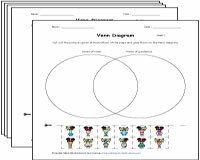 Venn diagram activity worksheets encompass cut-glue activities, preparing charts and taking surveys. Set notations are made easy for children through these activities. Teacher templates are also available here. Find the union and intersecting regions between two sets in the Venn diagrams and shade them. The worksheets provided for practice are split into various levels of difficulty. 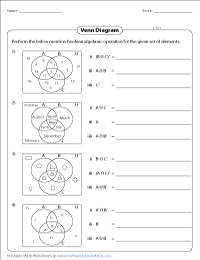 These Venn diagram worksheets feature three sets across varying levels of difficulty. Shade the unions, intersections, differences, and complements in the Venn diagrams given below. 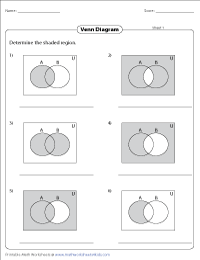 Name the shaded region in the Venn diagram worksheets and determine all the possible ways in which the unions, intersections, differences, and complements can be expressed. 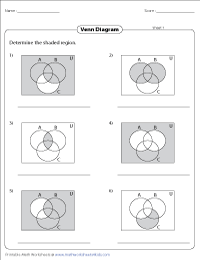 Find all the potential correct logical relations for the shaded regions in these Venn diagram worksheets which features three sets. 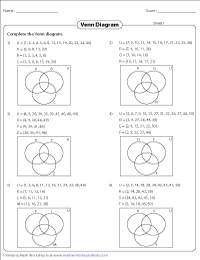 Read the Venn diagrams, find the required logical relation for the unions, intersections, differences, and/or complements specified in these worksheets. These Venn diagram worksheets feature three sets. Analyze them and write the set notations for the unions, intersections, differences, and/or complements given in these worksheets. Use the set of data given to complete the Venn diagrams. 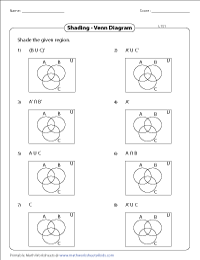 Find the correct logical relations and place the data in these Venn diagram worksheets. 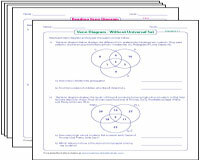 Venn diagram worksheets which feature three sets are provided here. Use logical relations to place the given set of data to complete them. Read, analyze, and draw Venn diagram and answer the word problems that follow. Universal set are also included. These worksheets help children to organize and analyze the data more efficiently. Answer the word problems, once you have read and analyzed the three-set Venn diagrams displayed here. Draw Venn diagram using the information provided and answer the questions that follow.